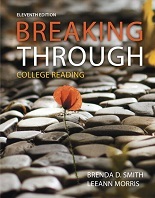 The lower-level (roughly grades 6-9) text in Brenda Smith’s two-book series, Breaking Through: College Reading, Eleventh Edition motivates and helps equip students with the skills they need to achieve their academic and career goals. The text emphasizes the building of prior knowledge – or schemata – one of the most critical elements in helping developing readers achieve. The use of actual college textbook passages offers immediate modeling and application of study and reading skills at a realistic level. Students first apply each skill to short textbook passages. They then build toward applying multiple skills to the longer academic selections that conclude most chapters.